I agree – you can tell this is a Christopher Nolan film. In the way it’s intellectual and the way the story is layered. There were several things I picked up on along the way (or close enough) so I understand what you mean about figuring things out. It wasn’t that it was obvious it was just, this is how these things work in a sci-fi story. Without going into detail in case any comments who hasn’t seen it – I really liked how subtle it was, how different themes played out in a very quiet way. I liked that he really captured the length of time it took and the desolation and quiet of space. And I also liked his female characters much better. Mal I don’t even love or think is a great character – though I do like Ariadne. Murphy was awesome and the actresses were fantastic. Brand was also pretty good but I would have liked her more, I think, if she wasn’t quite so stoic. I think you make a good point about Brand… I did feel she was sort of keeping the audience at arms’ length, but she had a lot of potential. I like the way you described the layering of the story, I agree with you there! Nolan will really have to blow something out of the water to top Inception, I feel! I understand your feelings for sure, but glad you still loved it! I haven’t seen it, but I sooo want to! I LOVE The Prestige and the Dark Knight trilogy. They’re my favourite movies of eeever. (I love Inception, but it’s too long for me, and I don’t think it’s fast enough. But Arthur…ohh, much love for Arthur. 😉 I’m very curious about this one, especially with the harder sci-fi angle. Pity it’s not his strongest ending though. And I never thought about his under developed female characters in previous movies but…yes. I see that, now. Well be warned this movie is pretty long… over 2.5 hours. It didn’t feel slow to me though; I thought the time was pretty well-filled. Hope you enjoy it! Yes, can’t wait to hear your thoughts! Aaaah! I really want to go see this tonight and review it myself later. But I’ll be sure to come back and check out your review afterwards! My review is spoiler-free, but yes, I hope you get the chance to check out soon too! Gah!! I saw it a few days ago and I am still floored. I loved every minute of it! I’m pretty sure I had never watched a film with Matthew McConaughey, but consider me converted. I honestly had no clue how the movie was going to end, and I’m really amazed that you did! The science in the movie is entirely plausible, and I have a few great links on my review that explain it perfectly. To be honest, I didn’t completely understand all of the science while I was watching, but that didn’t really take away from the film all that much(because I think the emotion in the film is so much more important than the science). I also can’t say enough about the soundtrack, and I’ve been listening to it almost constantly since I watched it! 😀 I really want to rematch it in theaters, if I have the time. Oh yes, it’s definitely about the emotions! I just discovered this morning that there is a book about the science in the movie, and I think it’s supposed to be written in a way that is friendly to the masses (not just for scientifically minded people), so I want to check it out sometime! SO glad you ended up loving the movie! Ooh, I am really looking forward to this. I don’t know how I haven’t seen it yet — I usually jump to see movies like this. Maybe a little of that has to do with McConaughey’s whisper talk. Speak up, man! I haven’t watched The Prestige yet, but I have seen both Inception (!!!) and The Dark Knight trilogy, all of which were fantastic, so it’s not that hard to believe that Interstellar is getting so many amazing reviews from critics everywhere. It’s really making me feel more excited than should be possible! Heh, Mathew McConaughey… I haven’t seen any films with him in it, and the first time I heard of him was from the egoistical speech he apparently gave during the Oscars (I think? ), so I don’t have that much of an opinion of him. I’m glad he turned out to be the perfect protagonist, though. I kind of get what you mean by the film not “crossing the line.” That’s always the problem sci-fi films face, if they want to make things seem REALLY realistic. 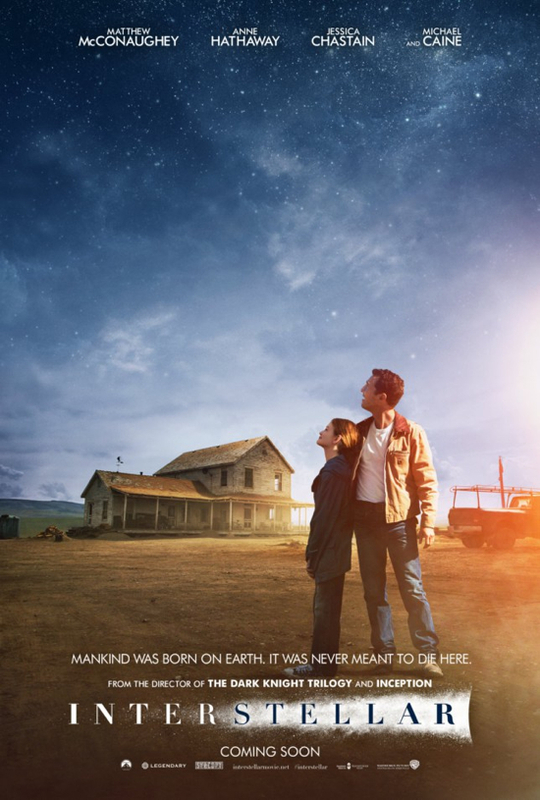 I have to admit that I was afraid I wouldn’t be able to grasp some part of Interstellar, too, since it looks really science-heavy (and even though I love sci-fi, I don’t always get science as a subject T_T), but after your review, I’m feeling a lot more relieved. Apparently this is a show that’s stunning in IMAX, so I’m still deciding if I want to watch it in a normal theater, or go see it in 3D. Overall, though, so, so happy that you loved this, Amy! I just know that I’m going to enjoy it, too. 😀 Fantastic review! It probably would be good in IMAX, if you have that chance. I saw The Dark Knight Rises in IMAX and was sort of disappointed for the money I spent on it, but there are a lot more epic shots in Interstellar, so it would probably be a little more worthwhile.